Mylan Pharmaceuticals — the company behind the price gouging of the EpiPen — is experiencing serious karmic retribution in the stock market. As the chart below from YCharts shows, Mylan’s market cap has been in virtual freefall since last Friday, falling by almost $3 billion. This crash coincides almost directly with the news of EpiPen’s price hike spreading nationally and attracting almost universal scorn,even from the likes of “Pharma Bro” Martin Shkreli, who famously hiked the price of AIDS treatment pill Daraprim last year. The EpiPen is a life-saving device commonly used by those with food allergies susceptible to anaphylaxis. 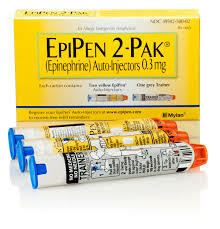 Should someone accidentally ingest food that prompts a potentially fatal allergic reaction, like peanuts or shellfish, the EpiPen provides an emergency dose of epinephrine into the person’s bloodstream, immediately alleviating anaphylactic shock. Sheldon Kaplan, who invented the EpiPen, designed it on behalf of the U.S. Department of Defense to provide an easily deliverable antidote to nerve gas. The company he was working for eventually released it for public use several years later. However, in 2007, Mylan Pharmaceuticals acquired the rights to the EpiPen and immediately started raising the price. After Heather Bresch, its former top lobbyist, successfully pushed for legislation in Congress that required all public schools to carry EpiPens for children with food allergies, its price hikes became more frequent and more severe, raising by at least 10 percent every other quarter from the fourth quarter of 2013 to the second quarter of 2016. A score of U.S. Senators are calling for an investigation into the price hikes. Bresch, who is the daughter of U.S. Senator Joe Manchin (D-W.Va), eventually became Mylan’s CEO, and subsequently raised her own salary by 671 percent. And in 2014, Bresch reincorporated Mylan in the Netherlands, utilizing a controversial accounting tactic known as “inversion,” lowering the company’s effective tax rate while still maintaining its headquarters and manufacturing base in the US. As of this writing, Mylan’s stock shows no sign of recovery, and Heather Bresch has not yet responded to calls for a hearing before the U.S. Senate Judiciary Committee. A petition by The Other 98% calling on Mylan to lower the price of EpiPens has accumulated almost 63,000 signatures as of 11 PM Wednesday evening.